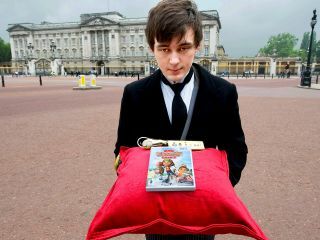 The Royal Wii - but what is the tech behind Nintendo's next console, due to be revealed at E3 2011 in June? Following earlier news that the Wii 2's controller is set to feature a 6.2-inch touchscreen, further details on the tech behind Nintendo's next console have been revealed. Nintendo is said to be considering "Stream" as a potential name for the new console, according to trusted sources at IGN. IGN's sources also reveal what they claim to be the tech details on Nintendo's rumoured Project Cafe console, as well as the estimated price, release date, design and lots more. The new Nintendo console is said to launch in the US at a price point between $350 and $400, with the final pricing still to be decided depending on manufacturing costs. The machine will actually be produced in Taiwan, by Foxconn, which also allays gamer's concerns about potential delays due to the recent (and ongoing) Japanese earthquake crisis. The plan is apparently for Wii 2/Project Café/Stream (or whatever Nintendo finally calls the new console) to leave the factory this coming October, potentially in time for a pre-Christmas release in November. IGN's source also claimed that the new Nintendo console is based on AMD's R700 GPU architecture "and not AMD's Fusion technology as previously believed, which will out-perform the PlayStation 3′s NVIDIA 7800GTX-based processor." The source also claims that the new Nintendo system's CPU will be a custom-built triple-core IBM PowerPC chipset, much like that inside the Xbox 360, but adds that the clocking speeds will be faster and that "the system will support 1080p output with the potential for stereoscopic 3D as well, though it has not been determined whether that will be a staple feature." Finally, in terms of form factor, Nintendo's new console is going to be considerably larger than the Wii, with IGN's source claiming that it will be more comparable to the Xbox 360 in terms of size and design. Wii 2, Project Café, Stream, or whatever else they decide to name it, we expect to hear lots more official details on Nintendo's new console from E3 in Los Angeles this coming June.